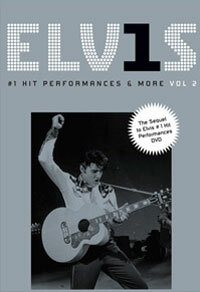 Available for pre-order from Shop Elvis is the DVD "Elvis #1 Hit Performances & More Vol. 2". This collection showcases 15 additional magical performances by the King Of Rock ‘n’ Roll. Culled from his TV guest appearances, movies, and concert films and television specials – from 1956, his breakthrough year, to the 1970’s when he reached the pinnacle of his career. This DVD contains the 15 bonus tracks that were included on the non-U.S.A. versions of this DVD from last year. Blue Suede Shoes - From Elvis' screen test for producer Hal Wallis at Paramount Studios on March 26, 1956. I Want You, I Need You, I Love You - July 1, 1956. Elvis performs in white tie and tails on The Steve Allen Show. Love Me - October 28, 1956, from Elvis' second appearance on The Ed Sullivan Show. Too Much - January 6, 1957, from Elvis' third appearance on The Ed Sullivan Show. The single “Too Much” held the #1 spot in the USA for 3 weeks and peaked at #6 in the UK. Treat Me Nice - From Elvis' third film, 1957's Jailhouse Rock. “Treat Me Nice” was written by the prolific tunesmiths Jerry Leiber and Mike Stoller. Trouble - A performance from Elvis' fourth film, 1958's King Creole - the most critically acclaimed of his movies and his personal favorite. Wooden Heart - A performance from 1960's GI Blues - Elvis' fifth movie and the first after his discharge from the US Army. Rock-A-Hula Baby - From the 1961 film Blue Hawaii. As the flipside of “Can't Help Falling in Love” from the same film. Bossa Nova Baby - From the 1963 film Fun in Acapulco. That's All Right - Shot in June 1968, during the taping of what became known as the '68 Comeback television special, which first aired on December 3rd of that year. Elvis performs the song that started it all. “That's All Right”, recorded for Sun Records in Memphis in July 1954, was Elvis' first record release. One Night - From the June 1968 taping of Elvis' '68 Comeback TV special. If I Can Dream - Elvis' classic live performance of “If I Can Dream” in the white suit, as seen as the finale of his '68 Comeback TV special, combined with components of two lip-synch performances in black leather that were shot during production but not used in the special. Don't Cry Daddy - Shot during production of the concert film Elvis, That's the Way It Is in 1970. Big Hunk 'o Love - January 14, 1973, from the concert in Honolulu presented as the global television special Elvis: Aloha from Hawaii. “A Big Hunk o' Love” was #1 for 2 weeks in the USA and peaked at #4 in the UK. An American Trilogy - From the 1973 global television special Elvis: Aloha from Hawaii. This performance is considered by many to be Elvis' finest recording of this piece. Again no performances from Elvis On Tour.Shame. I've really enjoyed Volume 1. I look forward to Volume 2. If you're a newbie just discovering Elvis this would be a good puchase to go along with vol. 1. Me? I've already got all this material. No sale. Hey Ep en Natha. Every fan has got these footage. yes maby the youngsters here but i think theire parents would have a dvd with (for example the 68 combecak-deluxe box) in the collection. But isnt that so i think the clipos should be remixed (included te spancox sound) a lot of disco light. A rapper who's talking sh... between the line what Elvis sings .And there we go. Again a chart topper. Almost every fool buys it because it brings him back in the charts. Aaron Presley, you are right. I occasionally meet elderly Elvis fans who don't know much about DVD releases. Others don't buy the movies. Moreover there are people who like Elvis' music but are no collectors. In any case this collection is a nice gift to them. For us this is indeed nothing special; though, Steve, I don't know how to do it myself. so they are happy, i think that's the whole point for this release..and that isn't a crime..right? Hard to get excited about stuff we've seen 1000's of times. Plus most of us can make our own compliations these days. great collection, if you were born in the year 2000..